Mission Viejo car owners know that under-inflated tires wear out more quickly. Under-inflation is also a major cause of tire failure for CA auto owners. More flats, blow outs, skids and longer stopping distances are all results of under-inflated tires. It’s hard for many Mission Viejo car owners to tell when a radial tire is under-inflated. If your automobile manufacturer recommends 35 pounds of pressure, your tire is considered significantly under-inflated at 26 pounds. The tire may not look low until it gets below 20 pounds. Uncle Sam to the rescue! A recent federal law required auto manufacturers to include a Tire Pressure Monitoring System – or TPMS system – in all vehicles. The system is a dashboard mounted warning light that goes off if one or more of the tires falls 25 % below the automobile manufacturer’s pressure recommendations. Your safety is our priority at Autobahn West. We want you on the road and accident free. We’ve traditionally provided things like tire rotations, snow tire mounting and flat fixes to Mission Viejo drivers at a very low cost. We’ve been able to quickly and cheaply provide the service, and we pass the low cost on to our valued Mission Viejo clients as an expression of our good will. That’s why we’re concerned about how you perceive the changes that this new law has required. Every time a tire is changed: taken off to fix a flat, a new tire installed, or a snow tire mounted, the service advisor now has to deal with the TPMS system. Sensors need to be removed and reinstalled. The sensors have to be reactivated after the change. And, unfortunately, the very act of changing the tire damages some sensor parts from time to time – it’s inevitable and can’t be avoided. CA service professionals have been trained on many systems and new tire-changing techniques. All of this adds up to significantly increased cost to the service center to perform what was once a very inexpensive service. So if you’ve noticed the cost of flat repairs, tire changes, and rotations going up, please keep in mind that it’s because of government mandated safety equipment. Your Mission Viejo service center just wants to keep you safely on the road – and it’s committed to do so at a fair price. Rememer, this change will help you avoid the most common vehicle failure, and possibly a catastrophic accident. Many Mission Viejo car owners want to accessorize their car – you know, make it theirs. One of the easiest ways to get a custom look is to get some new wheels. There are thousands of wheel designs at Irvine area tire shops to get you the look you want. And for many Laguna Niguel motorists, that look includes bigger wheels. It used to be that cars came from the factory with 15 or 16 inch wheels. Now 16, 17 and even 18 inchers are standard. And the factories are offering optional wheel packages up to 20 inches or more. So let’s talk about what to consider when you want to upsize your wheels. It’s not exactly a DIY project, so you need to know a thing or two before you get started. The most important term to know is rolling diameter. The rolling diameter is simply the overall height of your tire. Unless you want to modify your pickup suspension, you’ll want to keep your rolling diameter the same when you upsize your wheels. It’s important to keep the rolling diameter the same for several reasons. First of all, if the tire is bigger, it might not fit in the pickup wheel well. Next the speedometer, odometer and anti-lock brake system are all calibrated for the factory rolling diameter. In order for your anti-lock brakes to work properly, the rolling diameter must stay within 3% of the factory recommendation. If you ignore that, you run the risk that your anti-lock brakes won’t work properly. Low profile tires from top auto makers use special compounds that give the sidewall the strength it needs without compromising ride quality. As you increase your wheel size, you’ll typically get a slightly wider tire. This means that you have a larger contact patch. The contact patch is part of the tire that contacts the road. Because there’s more rubber on the road, the vehicle will handle better. And braking distances will be shorter. A lot of Mission Viejo folks with trucks or SUVs love the extra control. CA car owners need to watch out that the contact patch isn’t so big that the tires rub in turns or over bumps. What we’re talking about here is fitment. 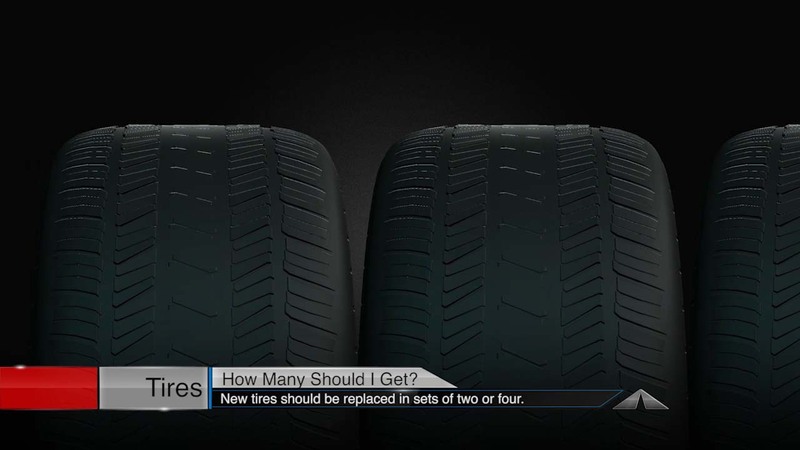 Your tire professional at Autobahn West can help you get this right. He’ll install your new wheels, add spacers if needed to make sure your brakes fit inside your new wheels, and get you rolling. 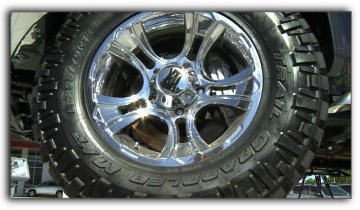 Also, if you drive off-road in CA a lot, you may need a higher profile tire to protect your new rims. And make sure your new tires have the load rating you need if you tow a trailer or haul heavy loads. Again, your tire professional at Autobahn West knows how to help. And don’t forget about tire pressure. If you have larger rims, your new tires will hold less air and they’ll need to run a slightly higher pressure. Forget that and you’ll wear your tires out fast. Finally, get an alignment at Autobahn West after you get your new shoes. AutoNetTV wants you to safely have the look you want. Stop by Autobahn West to learn more about how you might upsize your wheels or tires. You’ll find us at 25800 Jeronimo Rd. #200 in Mission Viejo, CA 92691. It seems like everywhere you go in the Irvine area you see custom wheels. Big trucks, little cars, mini-vans – it doesn’t matter, motorists are expressing themselves with custom wheels. Some CA motorists want smaller tires and wheels – some want larger – and some want them enormous. So where do you start if you want new wheels? At Autobahn West, we suggest you start with your budget. We know, that sounds so practical. But if the look you’re after goes beyond just new tires and wheels and enters into the world of suspension modifications, you need to be prepared for the additional cost. Let’s start with something easy – you want to give your ride a unique look and the stock wheel size is just right for you. One of the concerns you will have is that the new wheels have the same offset as your pickup factory wheels. First, what is offset? The wheel bolts onto the hub on the pickup’s axle. The distance from the inside edge of the wheel to the point at which it bolts on, is the offset. If the new wheel has a different offset from the factory, the tires may rub on the inside or outside of the wheel well. That could lead to catastrophic and (pricey) tire failure. Your tire and wheel professional at Autobahn West in Mission Viejo can help you find the right size wheel – or install adapters to make your new wheels fit. All you have to do is pick from the hundreds of styles available. So, what about Mission Viejo auto owners who want to upsize? Well, if you pick bigger wheels, but you want to keep the same overall tire diameter, that’s pretty easy for the team at Autobahn West. The same offset concerns apply. You need to know that the tires will likely be a little bit wider than the originals and you don’t want them to rub when you make sharp turns. Your tire professional at Autobahn West in Mission Viejo will help you avoid this. Mission Viejo auto owners who want to upsize should also be aware of possible performance issues. Bigger tires and wheels weigh more. CA automotive experts refer to this as unsprung weight because it isn’t held up by your pickup suspension system. Increased unsprung weight affects performance in different ways than an equivalent amount of groceries or little soccer players in the pickup passenger compartment. Acceleration is negatively affected. Stopping distances may also be increased – sometimes significantly. Mission Viejo car owners who want really big tires and wheels, might need to upgrade their brakes to compensate. Heading the other direction, some motorists in the Irvine area like to run smaller than standard wheels and lower the suspension. All of the same fitment issues still apply as well as calibration issues. Don’t think that pickup suspension modifications are a bad thing. Many systems actually improve ride, function and performance over the stock set-up. Regardless of your budget, you want your pickup to continue to do all the things you need it to do. Some of those show cars and trucks you see on TV and Mission Viejo showrooms look marvelous, but have been modified in ways that may not suit your needs. For example, if you put large rims on your SUV with low profile tires, you may be in for busted rims if you go off-roading a lot around Irvine. There just isn’t enough sidewall to absorb the impact of thumping over rocks. Some auto owners stuff the largest tires and wheels possible in their vehicles but have to severely restrict suspension travel so that the tires aren’t rubbing all day. That can lead to a very harsh ride around CA. Again, talk with your Autobahn West wheel professional about all of these things: how you drive in Mission Viejo, what look you are going for, your budget and what compromises you are willing to make. At the end of the day, you’re going to be rollin’ out of Autobahn West with one sweet ride.